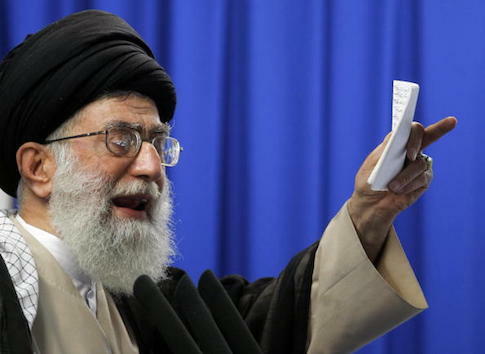 Iranian Supreme Leader Ayatollah Ali Khamenei wished death upon President Donald Trump and senior cabinet officials in a series of Twitter messages Friday justifying his country's routine chants of, "Death to America." "Down with USA" means down with @realDonaldTrump , @AmbJohnBolton and @SecPompeo," Khamenei tweeted at Trump, his national security adviser, and his secretary of state. "It means death to the American politicians currently in power. It means death to the few people running that country; we have nothing against the American nation." Khamenei appeared to be adopting the administration's own rhetoric, which has focused on eliminating Khamenei's hardline regime in Iran and liberating the Iranian people from its control. "As long as the U.S. practices savagery and vice, the ‘Down with USA' won't get off the Iranian nation's tongue," Khamenei tweeted. "The U.S. regime is the embodiment of evil, violence, creating chaos, and warmongering. The U.S. regime has always lived off trespassing for fulfilling its interests," the leader continued. "The U.S. is the embodiment of evil, then they complain why we chant ‘down with USA'?" The leader's comments come as the Trump administration moves to further tighten economic sanctions on Iran in a bid to choke off its funding streams and end the country's military efforts in Syria, Yemen, and other regional hotspots. Next week, U.S. officials and their counterparts from several nations, including key Arab allies, will meet in Warsaw, Poland, to discuss Iran's increasingly provocative military efforts and plan ways to stop the country. Iranian agents believed to be tied to the terror group Hezbollah have been found in the United States, fueling concern Tehran could order a strike inside America should tensions between the Trump administration and Islamic Republic reach a boiling point. Saeed Ghasseminejad, a senior adviser on Iran at the Foundation for Defense of Democracies, told the Free Beacon the threats by Iran's supreme leader should be "taken seriously" by American officials. "Khamenei leads not just one but several terrorist organizations and his direct threats against top US officials such as President Trump, NSA Bolton, and Secretary Pompeo should be taken seriously," he said. "Not only Tehran has had several successful assassination operations in Europe, but it has also shown that it has the will and capabilities to plan such campaigns in the United States." The U.S. should undertake an investigation into Iran's terror networks in order to pinpoint threats and shut them down, Ghasseminejad said. "At this point, a complete investigation of networks close to Tehran is necessary and long overdue," he said. "Washington should reduce Tehran's capabilities to initiate malicious operations in the US by decisive actions against pro-mullahs networks in the United States." This entry was posted in National Security and tagged Ali Khamenei. Bookmark the permalink.